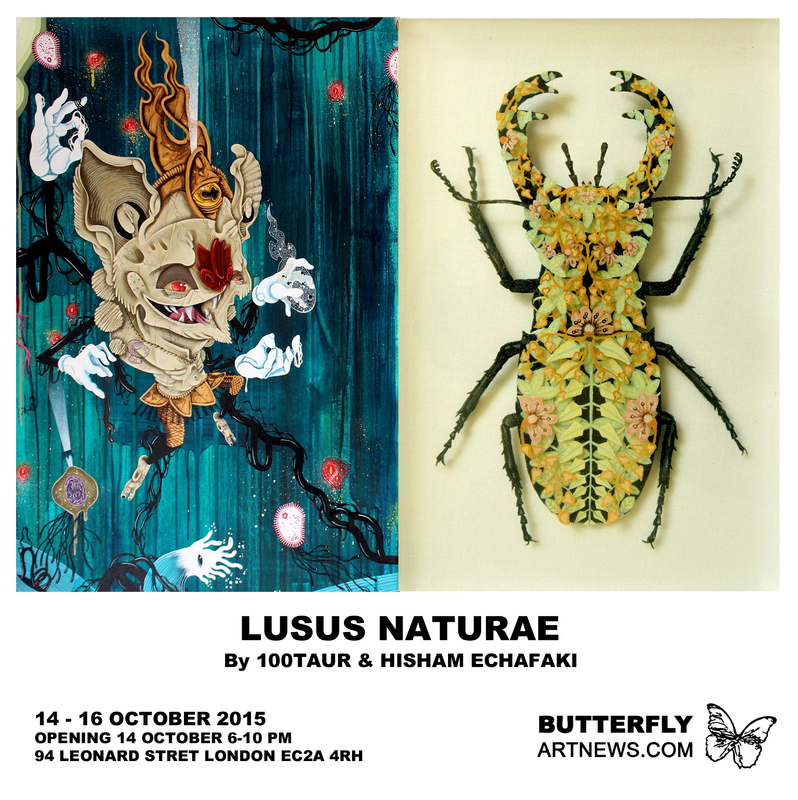 Lusus Naturae is a two-person exhibition with French artists 100TAUR and Hisham Echafaki featuring a series of new paintings, drawings and three dimensional works. Curated by Butterflyartnews, the show explores notions of anthropomorphism, human fascination with oddities or monstrosities and our fragile relationship with the natural world. The works on display invite the viewer into a world where fantastical hybrid creatures evolve alongside wonderfully bizarre animal figures. 100TAUR’s mythical monsters are portrayed in a surrealist dark enchanted world with colourful details rich in narrative. Hisham Echafaki’s paintings play with intricate repetitive patterns found in nature and examine the impact that humankind exerts on its fragile balance. For the first time Hisham Echafaki will also present a series of his three-dimensional paintings. Using a unique technique of resin layering and acrylic paint, the artist meticulously builds layers to create three-dimensional insects in transparent boxes. Oniric butterflies, bees and dragonflies appear to be suspended and preserved in the manner of fragile taxidermy insects.